In all eukaryotic cells, each fundamental process-cycle progression and its control, protein secretion and targeting, transcription and its regulation, mRNA processing, and DNA replication-accomplished by essentially identical cellular machinery composed of essentially identical protein components. This conservation of function has catapulted the yeasts Saccharomyces cerevisiae and Schizosaccharomyces pombe from parochial backwaters to the forefront of experimental molecular biology: What is true for a yeast is true for an elephant, and in experiments you can get the answer a lot faster from a yeast. 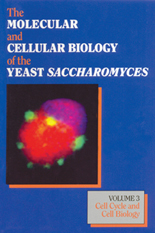 This burgeoning appreciation of yeasts as model systems for the study of fundamental cellular processes has highlighted the need for an update of the seminal 1981 monograph The Molecular Biology of the Yeast Saccharomyces. This need is now met by the publication of a three-volume series to serve as the authoritative sequel. The first volume focuses on the genome organization of the yeast Saccharomyces as well as protein translation and its regulation and energy metabolism. Subsequent volumes emphasize such topics as the cell cycle, secretion, and transcription. Together, these volumes provide a comprehensive survey of the molecular and cellular biology of Saccharomyces and Schizosaccharomyces, serving not only as a current summary of every significant area of investigation, but also as a thorough reference source. These volumes are required reading for everyone in the field and anyone curious about the state of the art of molecular and cellular biology.